Andalusite is best known for its strong pleochroism and it's unusual color which is frequently a mixture of both red and green. It isn't considered to be a color change stone but it frequently shows two colors, (red and green) at the same time. Rough crystals will often show green in one direction and red in another. The color is difficult to match on any any standard color chart. 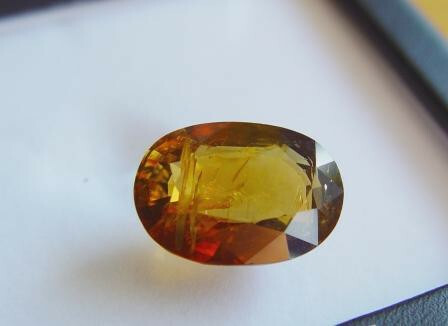 Ocurrence: Brazil, Sri Lanka, Spain, East Africa, Burma, U.S.A.
Andalusite is popular as a collector stone but is seldom used in jewelry probably because of it's unavailability. With a hardness of 7 - 7.5 andalusite is tough enough to be used in jewelry. Andalusite, especially in the rough, can easily be confused with alexandrite because of similarities in color.